Hollywood bad boy Johnny Depp has finally been nominated for an Oscar. But will playing a pirate inspired by Rolling Stone Keith Richards bring home the booty? We talk rock and roles with the star. Johnny Depp’s colourful portrayal of Jack Sparrow in Pirates of the Caribbean is just the latest great performance from a man who has starred in some of Hollywood’s most memorable movies, from Edward Scissorhands to Ed Wood. The actor, who lives in France with his partner, French singer Vanessa Paradis, and their two children, Lily-Rose, four, and Jack, nearly two tells us why he based his pirate on a rock'n'roll legend . 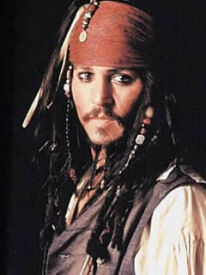 . .
You were already friends with Keith Richards, so how serious an imitation of him was your pirate? Yeah, I met Keith quite a few years ago and he’s been a hero for ever. But it wasn’t really an imitation of him. It was a salute to him. Beyond being the greatest rock'n'roll star of all time, I also think that he’s an incredibly interesting man outside of the Stones. He’s unbelievably wise. He’s like a sage, a Buddha or something. Is he the greatest guitar player in the world? Ever, ever. I mean, king. His timing is amazing. What made you think of Keith when you were cast as a pirate? To me, pirates were the rock'n'roll stars of the 18th century—freedom, adventure, women, outlaw behaviour, all of that stuff. Are you a bit of pirate yourself? I’ve never thought of myself that way. I never got that whole rebel thing. It was just something they slapped me with, to be able to have a name for the product really. But you have always done offbeat roles, haven’t you? Have you taken your daughter on the Pirates of the Caribbean ride at Disneyland? Yes, we went on the ride. It was more like Daddy was going, ‘Hey come on, let’s check out The Pirates,’ because I loved it when I was a kid. So, she went on it and she loved it. Has having a son made a difference to your life? Oh, yeah. Kids give you strength and perspective. Things that would have made me upset or angry before, now I can go, ‘Oh piss off. I’m just going to play Barbies with my daughter.’ The differences between a little girl and a boy are really shocking, though. She’s very elegant and everything has to be perfect. My boy screams and runs straight into the wall. Then he gets up, shakes himself off and does it again. Do you lead a relatively normal life in France? We get a little bit of attention. Your wife is also a big star there, isn’t she? Yeah, Vanessa gets a lot of attention over there. We get the occasional paparazzo, but I figure if you’re going to get me, just bring a really long lens and make sure you’re really far away because if I can get my hands on it, it could get ugly. I don’t care if they take my photograph or Vanessa’s, but when they start taking photographs of my kids and putting them in magazines, that I can’t support. That’s why they need a long lens because, if I catch them, I’ll bite their nose off and swallow it.